Mirra Li, a koala at the Vienna Zoo. Photo courtesy of Norbert Potensky and the Vienna Zoo. In a recent study, published in Molecular Biology and Evolution, scientists from the University of Illinois discovered that 39 different KoRVs in a koala’s genome were all endogenous, which means passed down to the koala from one parent or the other; one of the KoRVs was found in both parents. Koalas are the only known organisms where a retrovirus is transitioning from exogenous to endogenous. An exogenous retrovirus infects a host, inserts its genetic information into the cell’s DNA, and uses the host cell’s machinery to manufacture more viruses. When an exogenous retrovirus infects an egg or sperm cell and the viral genetic information is then passed down to the host’s offspring, the virus becomes an endogenous retrovirus (ERV). Like humans, koalas have evolutionary defenses against endogenization. In order to end up with 100 ERVs in an organism, the species may have to start with 10,000 ERVs in its ancestors, Roca said. It takes retroviruses, like KoRV, many thousands of years to become a fixed part of the koala genome, like the eight percent of retroviral DNA that all humans share. The ERVs that are successfully passed down are protected by the koala’s DNA repair mechanisms so that their rate of mutation is extremely low. Based on the dearth of mutations in the endogenous koala retroviruses, Roca’s team was able to estimate that the KoRVs integrated into the host germ line less than 50,000 years ago. “This is quite recent compared with other ERVs that are millions of years old and have accumulated mutations,” said first author Yasuko Ishida, a research specialist in Roca’s lab. In koalas, KoRV has been linked to leukemia, lymphoma, and immune suppression, which can lead to increased susceptibility to chlamydia. In mammals, retroviral DNA is associated with placental development and has been found to protect hosts from harmful exogenous retroviruses. In the 1900s, koalas were extensively hunted for their fur. 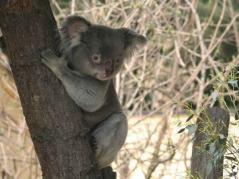 In an effort to preserve koalas, a few individuals were moved to an island off the coast of Australia. Years later, the inbred island population was reintroduced to southern Australia. Today some of the southern koalas remain uninfected while almost all northern koalas have dozens of KoRVs in their genomes. Roca’s research team included research specialist Yasuko Ishida, graduate student Kai Zhao, and scientific collaborator Alex Greenwood of the Leibnitz Institute in Berlin. Their work was supported by the National Institute of General Medical Sciences. The San Diego Zoo, Columbus Zoo, San Francisco Zoo, and Riverbanks Zoo provided the koala samples.